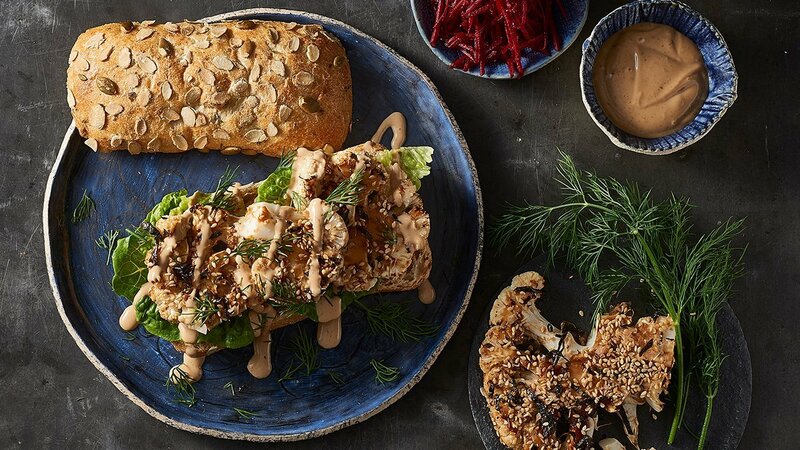 Cauliflower steak with Japanese sprinkle, goes sandwich style. Yes please - I will take two… Keep your cost down by substituting proteins for veg. Heat a dry, heavy-bottomed skillet over a medium high burner. Pour in the sesame seeds and shake to distribute evenly over the surface of the skillet. Toast, shaking occasionally, until the seeds are fragrant and begin making little popping sounds. Immediately pour the seeds into a dry, clean bowl to cool and stir in the sea salt. Allow to cool completely before proceeding. Use kitchen shears or clean, dry scissors to cut the nori into 1-inch strips. Stack the strips and cut cross-wise into very thin strips over the bowl of sesame seeds. Use the kitchen shears again to roughly cut up the bonito flakes. Add the sugar (if using) and stir all ingredients together, then transfer to a jar with a tight-fitting lid. This is ready to use immediately but can be stored in a cool, dry place out of direct sunlight for up to two months. Lightly toast burger buns ready to serve. Wash and drain cos lettuce and set aside ready to use. Seal cauliflower steaks on the grill and the lay onto an oven tray ready to bake. Brush with teriyaki sauce then bake until just soft. Remove from oven and sprinkle with Furikake seasoning.